So, this is my final part of a series of posts on creating a regional sandbox map. In brief, we have been using random (or even, dare I say, subconscious) systems of mapping and encounter planning to supply broad strokes of our campaign region. After this first step we have been thinking through the features that appear and fleshing them out with an eye on the narrative potential of the results. Essentially, if you roll it on the Judges Guild tables, you have to explain it somehow in the fiction of play, across a whole region the size of New York State. At this point in the process, most of the divining and reading of the oracles is finished. 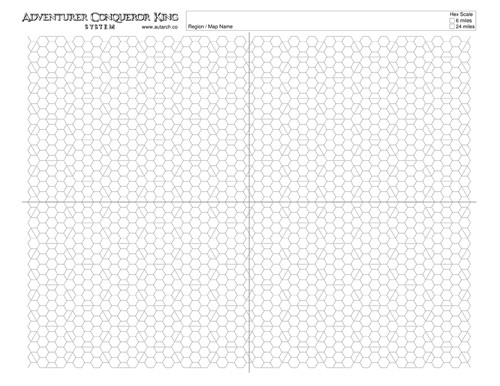 We have our hex-map that has formed a core of detail around where the players have been placed in the start of the campaign. 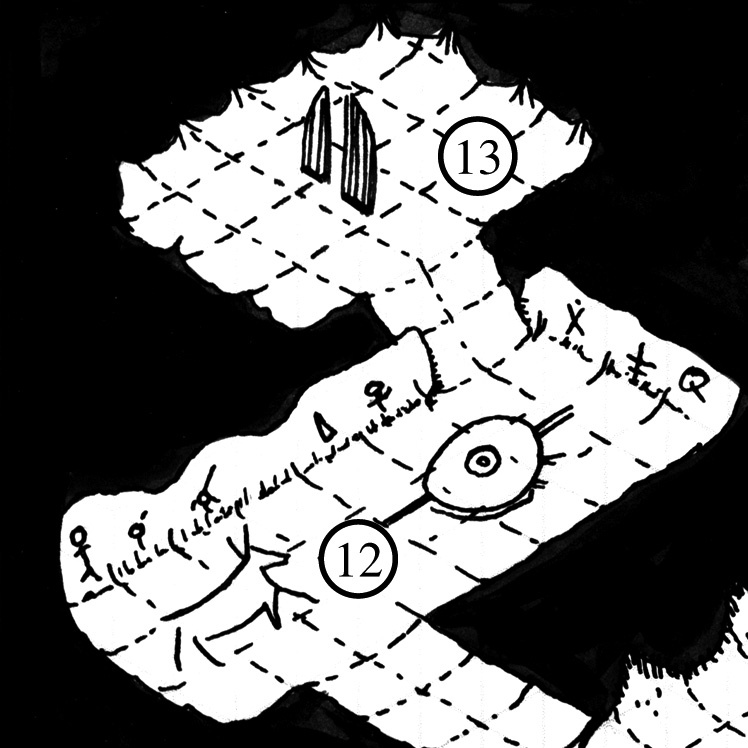 There are still many other encounters on the map that are broadly painted and ready to be fleshed out as needed when the players approach, but for now we have all the pieces that are necessary for several weeks of table play, possibly months. The only thing that is missing is a map of the region that the players might acquire in a dungeon haul or civilized area, a map made within the fiction you might say. I always pictured my campaign for this map as a place where the players would be plopped into the landscape via a magical portal. Once they found a city they could obtain a loose map of the area but they would have no prior knowledge of the lay of the land beforehand, thereby emphasizing the hex-crawling and exploration elements. Two things are readily apparent on close inspection: I have a trouble with good place-names and my calligraphy is not up to snuff. I wanted to just bang out the map so some of the crudeness is intentional for the sake of speed, but also notice what a difference a bit of color makes. 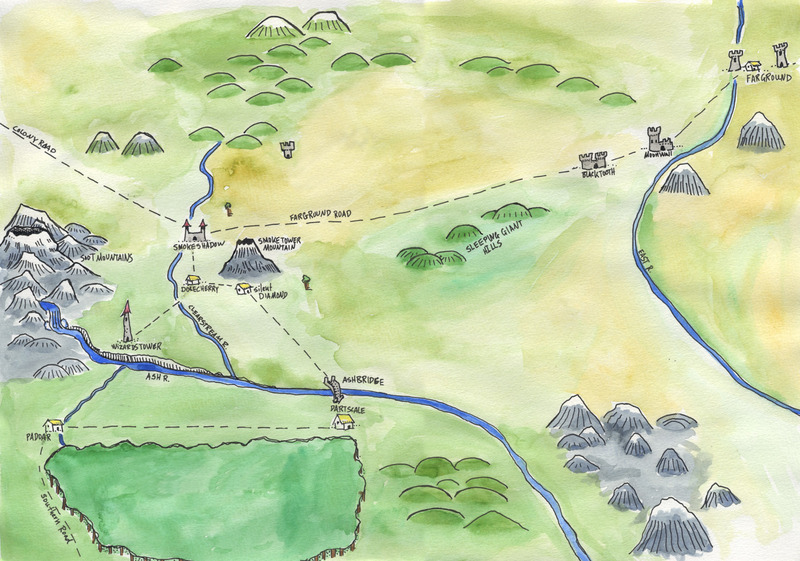 Instead of drawing a map in pencil, giving it to the players across the table and telling them “you receive this crudely painted map”, I can now just hand them a crudely painted map. It’s not professional fantasy cartography, but the feel and saturation of real painted paper is hard to beat for a game prop. The obvious difference is that I have excluded any map reference to ruin or lair entrances as that would take the player exploration/tracking accomplishments away from them. 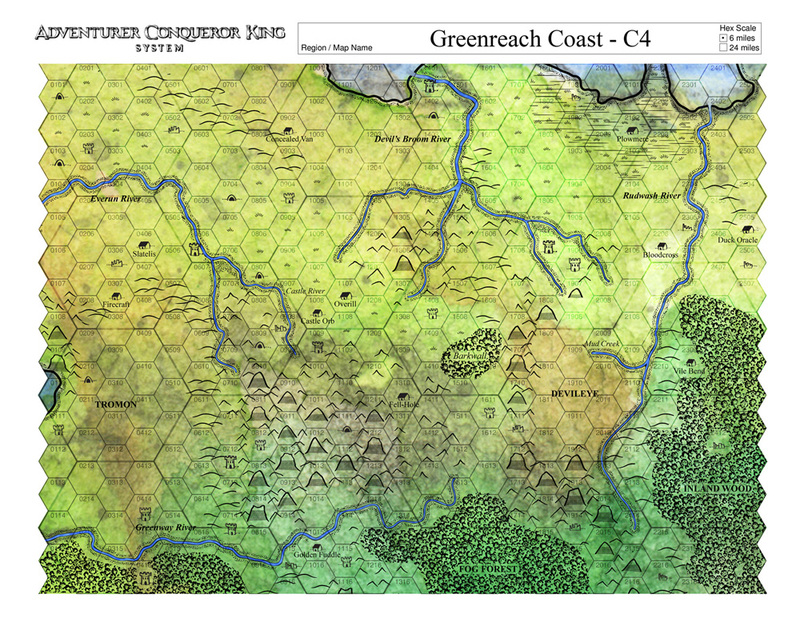 I suppose it is reasonable to place those on your player map depending on your campaign style but I would prefer that my player’s get there by tracking down rumors and chasing trouble. The physical steps for creating the map are pretty simple and favor the visually-skilled DM but well within anybody’s effort. Take a thick sheet of watercolor paper and pencil in the locations of all the major features of your chosen map region taking into account the roads, rivers, and position of forests and mountains. You don’t need to draw in each mountain and tree, but you should outline the regions where they go. This is where you can get all odd with your distances to reflect the quasi-medieval sense of travel and distance. Emphasize the position of the larger cities and the close villages, the cartographic artists probably never left town anyway. Organize the shapes as something that is pleasing as an image and not really accurate to “life”. Take a black pen, I recommend a technical marker like a pigma or rapidograph, and practice making some uniform symbols for each of the terrain features that will be in your map. Notice how some of my mountains or hills look crappier than others? That is because I did not practice enough and was adjusting my style as I drew on the map. Draw in your symbols and features, paying close attention to the placement of your rivers, villages, castles, and cities. For example, make your expertly crafted city symbols first and then connect them with roads afterwords. Keep a look out for river crossings and mountain passes too. Double the black outline on large or important feature like big volcanoes or skull-shaped mountain edifices. Erase all the pencil marks off the page with a white vinyl eraser, the blank ink should all stay put. Now the fun part, get out your watercolor kit and mix up some nice greens, ochres, grays and blues to color in your nice ink drawing. Watercolor is it’s own beast. It is literally the hardest painting technique to learn (seriously, even fresco allows you to paint over). But the whole point is to have fun. My advice is to paint with the tip of the brush hairs for the details, use a napkin to knock excess water off the brush, and try painting into pre-wetted area of the paper to see the color bloom out. Let your map dry thoroughly for a bit and then place your painting under a stack of heavy books. (where will you get those oh gamer?) You can glue a little map-maker’s seal or a written legend in a empty area of the map. Give the map to the players at the table and watch them crudely mark it up as they explore and get cheeto dust all over the fine elven woodlands. Thanks for tuning into this little series of posts and I hope you have some fun making and playing on your maps soon. Create a nebulous outline of a continent map with scribbles and loose pencil drawing. Use a cheap watercolor kit to randomly splatter our map with terrain colors and then paint in all remaining white paper with chosen color areas. Make a high resolution scan of our loose painting and zoom in on a region to map. 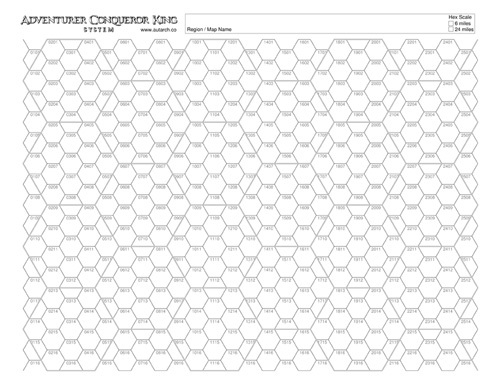 Use free graphics software to place a hex grid on our chosen map region. 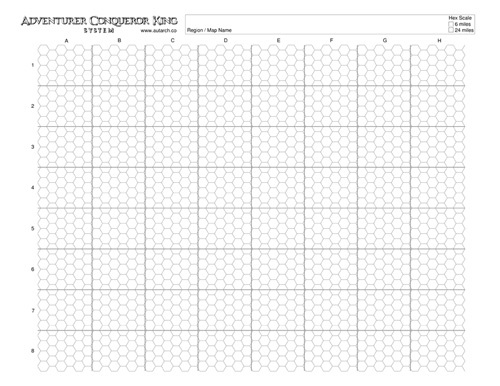 Use old Judges Guild random tables and maybe a computer script to roll our encounters for each hex and determine if they are a Village, Castle, Ravaged Ruin, or Lurid Lair. Draw in loose roads to connect villages and castles with compatible alignments. Start to think of the narrative reasons for differences in alignment and race between populated areas. We have come to a loose understanding of an adventuring region of about the size of New York State or just shy of the surface of Oregon. We know where the major attractions and mysteries lay. We know which ones are bad/chaotic and which ones are good/lawful. We don’t have their names or their specific details, but these can be rolled up on the fly as the PCs travel through the land. What we really need is a solid chunk of tight territory with more information that can serve as a home-base region for a new campaign. I am in some old red-box style campaigns that have stretched for multiple years of play and I don’t think we ever got the itch to strike out overland, long distance, all at one go. It is always a gradual expansion of known territory. Maybe the big sweeping exploration is for level seven and higher, where you can fend off the frightening probability of OD&D wandering dragons, but I know that a “Keep on the Borderlands” or “Nentir Vale” size area is a good starting point for a beginning campaign. The time has come for us to draw in some hard features on a hex by hex basis. We need to name our places, determine our inhabitants, and find their relationships to drive the interests of our players that stalk the six-sided wilderness. The first thing that I did was to consult my main region map and find out where my encounters were. I made up a consistent little map symbol for Castles with a little tower , Lairs with a little cave, Ruins with some crumbling structure, and Village hexes had some square dots that seem to indicate a building plan. I admit that the villages look a little unclear but I was trying to ape the B&W cartography of the Wilderlands Of High Fantasy Maps and failed. I like my little towered city better in the center. After the main encounter symbols went down, I connected villages and some castles with road systems represented by dashed lines. I tried to imagine the paths of least resistance while traveling through the splotchy terrain and then also started to put rivers, mountains, and forests in where I thought the color of the paper demanded it. Notice how I put a high pointy mountain symbol on all the dark gray watercolor spots and then the smaller hill features around the other rough spots. In the process, I saw a yellow patch of earth on the south-east corner of the map and decided that some hills would form a rain-shadow over an arid section of the region. I guess I have some rudimentary weather patterns now. The rivers should be placed so they are always flowing downhill in some manner, so I usually started them in mountains or hills and had them flow through or by villages on their way to the ocean. Creating the roads first reminds you to draw in a bridge or a ford in the waterways when you need to. It is better to put the information on the map so you won’t forget about it later. I made a shadowy outline of the forest and decided it would represent a real thick wood. There would be trees and sparse copses in many hexes but I wanted the big green spots to be unbroken forests. 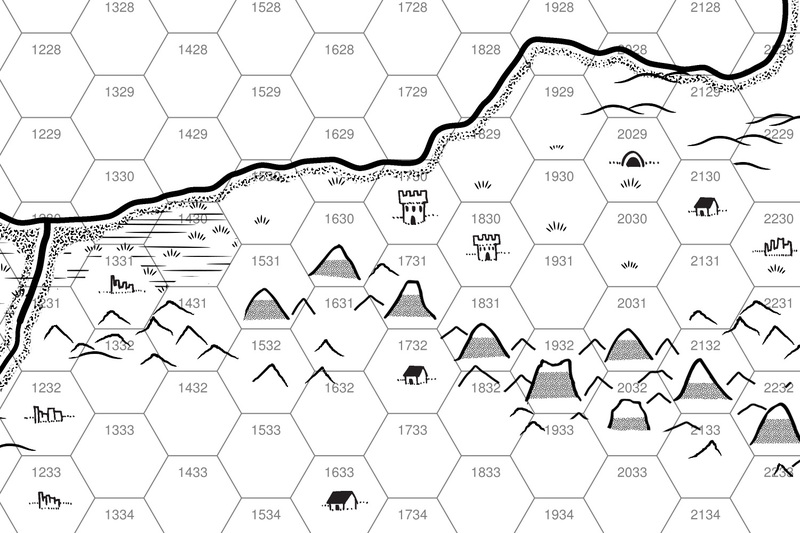 All the blank hexes would be either plains, or scrub, or grasslands, or gentle hills. 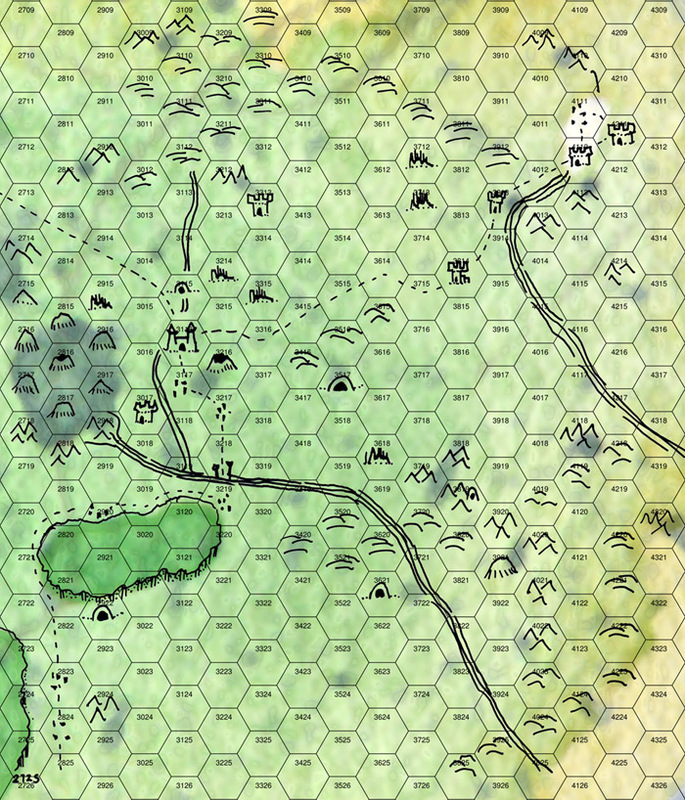 I guess I could also come up with symbols for those hex types but I liked the effect of the color popping through the map. The drawing and symbols are not all consistent or neat, but I was doodling directly without practicing much so I think it came out alright considering. The information that the map contains is what is important. You shouldn’t have to worry about how your map looks unless your players are going to see it, like a handout map. So tune in for the sixth and final part of my sandbox mapping posts… the Player Handout Map. 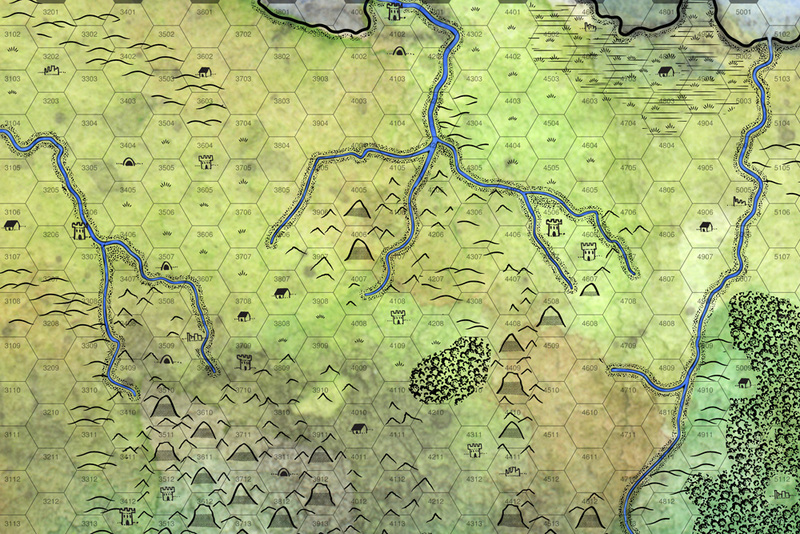 So for my Ouija-board-esque method of sandbox mapping, I had made a hex-grid of my chosen region and I applied the nebulous hues of the terrain with a kid’s watercolor kit. 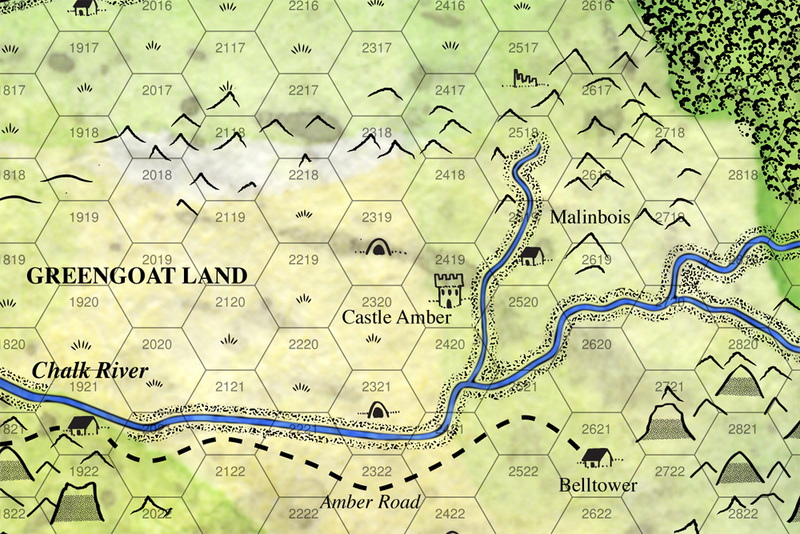 I now needed to provide more details for adventuring like roads, rivers, villages, mountains, hills etc. The first step was to go straight to my Judges Guild encounters that I rolled up using my junky little python script. 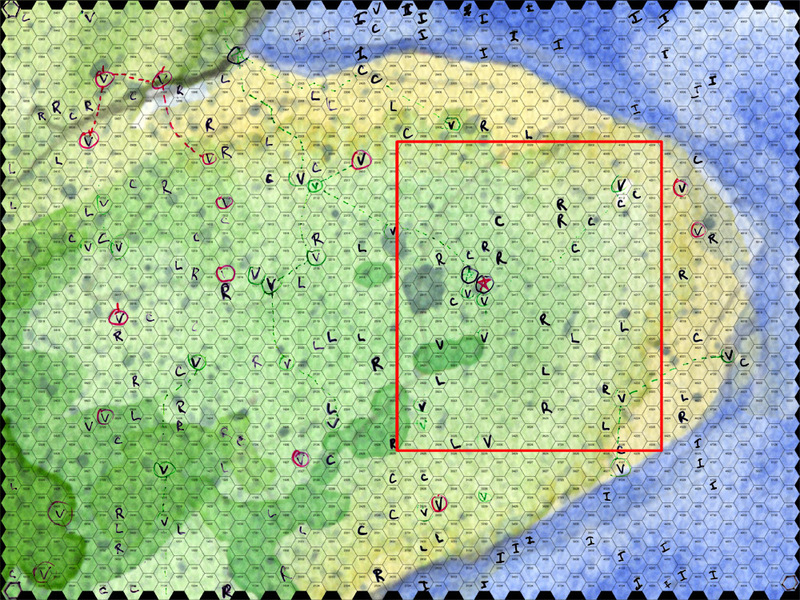 It gave me a final printout with about 150 different villages, castles, ruins, and layers listed by hex coordinates that I could place right away without looking at the underlying terrain colors. I did not have details of all the encounters. The lairs and ruins could be rolled up later, but the castles and villages were really important in that they had an alignment and a race associated with each listed encounter. Evil castles or villages would get a red circle and good villages and castles would get a green circle. Right away, I had clumps of good settlements and clumps of evil settlements that could suggest some type of politics or borders in my small local region. I could start putting in dotted lines to connect the villages and castles with roads and start wondering about how the encounter placement worked in a narrative sense. Why would an evil hobgoblin settlement be right next to a lawful-good human settlement? Maybe there is a siege going on, maybe the Hobgoblins are a large mercenary camp that defends the larger human village. Why are there evil dwarves occupying this castle? This sandbox style of planning is all about divining some type of meaning from what the random results provide. There is always the ability to fudge, but the whole point of the method is to provide a springboard to your interpretations. So I had a rough idea about what encounters goes where on the region map, and I could continue to flesh out the whole area, naming all the villages, placing all the roads, and placing the definite terrain and rivers all within a hundred or so miles of the characters. But then again, do I really need 150 encounters and surrounding terrain detailed to begin play? I didn’t think so. And besides, one of the key tenets of sandbox play is to structure details around what the players start to provide. We needed to leave room for the screwed up village that one of the PCs originates from.